Download the advert for the pensions ballot to display in your workplace. Members who are directly employed in NHS Ambulance organisations will be balloted. This will also include Isle of Wight Ambulance members employed by the PCT. As in the previous ballot, students (unless in full time employment with the NHS ambulance organisation) will not be balloted. Why are we running the ballot? UNISON’s ambulance sector identified that an ‘action short of a strike’ mandate would give more flexibility for 999 service staff to participate in industrial action, rather than either take strike action or work as normal to provide cover. This ballot gives a separate – additional – mandate to the existing ballot for strike action, and does not supersede it. When will the ballot open and close? The ballot will open on 9 December and papers must be returned in the pre-paid envelopes by 3 January 2012. Where can members get papers from? 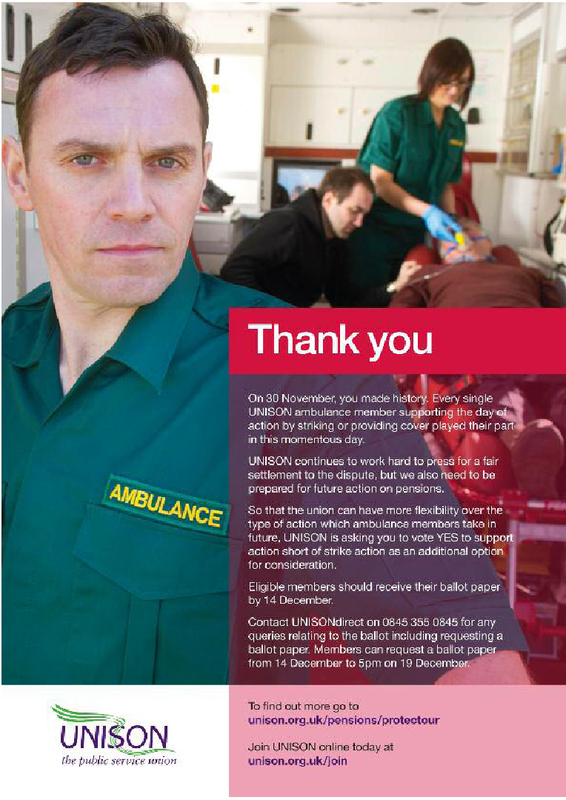 Eligible members who have not received papers by 14 December are advised to phone UNISONdirect on 0845 355 0845 and ask for the Ambulance Ballot hotline. We will contact you shortly after the ballot closes on 3 January to notify you of the result. Has further action been called on pensions? Not yet, and it is difficult for us to identify at this point when action will take place. We will of course comply with the legal requirements and notify and consult members. UNISON is still working hard on your behalf to press the Government to reach an acceptable negotiated settlement on changes to your pension scheme, but we need to keep up the momentum to ensure that we are able to take further action should this be needed to strengthen our position. This means that the union can identify the type of action which each group of staff in your workplace can take. This may be the same action for all groups (e.g. work to rule) or identify actions which are particular to each group of staff. In the event of a YES vote, your regional team will be working closely with the ballots department to identify what actions are most suitable for members to take in your workplace.